Jung "Mvp" Jong Hyun is a Korean Terran player in both Starcraft: Brood War and Starcraft II, and is a 4-time GSL champion. As a Brood War professional, Mvp's most notable individual accomplishment was reaching the Round of 8 of the 2010 Hana Daetoo Securities MSL, where he played against Flash and won a set through amazing macro and Battlecruiser control. 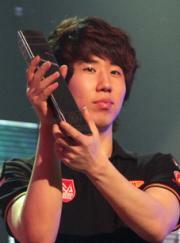 He switched to Starcraft II shortly after the 2009-2010 Shinhan Bank Proleague ended. In SC2, he is famous for his overwhelmingly strong macro management in the middle to late game. He is also well-known for having some of the best marine control amongst pro-gamers, and for his heavy Battlecruiser play in TvT matchups. At present, Mvp is ranked #218 in highest overall earnings, and #42 in highest earnings for players from Korea, Republic of. Out of the 69 tournaments awarding cash prizes that Mvp had competed in, the largest amount was $50,000.00 from BlizzCon 2011 (StarCraft II) on October 22, 2011. He placed 1st, making up 12.21% of his total prize money won. Mvp overtook the $100,000 milestone on September 10, 2011, winning $46,420.95 and placing 1st at GSL August 2011 (Code S). Prize money from 19 tournaments got him to that point.